Human actions have boosted carbon dioxide concentrations in the atmosphere to levels higher than any measured over the last 160,000 years. Rising concern over the risk of severe impacts from climate change is spurring research into ways in which ecosystems may mitigate global warming by storing excess carbon in plants and soil. Our research group has studied the ecology of mangroves for over 40 years. Mangroves are tropical forests that thrive in salt water, forming a canopy with the atmosphere and extensive roots in the sediment of the intertidal zone – the area that is above water at low tide and underwater at high tide. Scientists refer to them as “blue” carbon ecosystems, in contrast to “green” carbon ecosystems on land, such as forests and grasslands. In a recent study, we estimated that the wood and soil of mangrove forests along the world’s coastlines hold 3 billion metric tons of carbon – more than tropical forests. We have also shown that previous studies have overestimated blue carbon storage in some river delta areas, such as the Amazon in Brazil; the Sundarbans region in India, where the Ganges, Brahmaputra and Meghna rivers converge; the Zambezi delta in Mozambique; and the Indus river delta in Pakistan. Others have grossly underestimated blue carbon storage in carbonate (peat-dominated) coastlines, such as Belize, the Florida Keys, Puerto Rico, Mexico’s Yucatan, Cuba, the Dominican Republic and several Caribbean islands. The key to improving these estimates, we found, is to factor in how rivers, tides, waves and climate shape coastal landforms to create different environmental settings. Using this approach, we have produced a more accurate estimate of global blue carbon “hot spots” – an important first step toward protecting them. Mangroves can extend along tropical shorelines to the very edge of warm temperate climate zones, controlled by changing frequency of frosts. They grow where tides and salt from oceans meet rivers carrying sediments from continents, mixing to form different types of intertidal zones. Deltas exist where large rivers with very turbid waters and very little salt deliver sediment to the coast, forming extensive mud banks. In contrast, lagoons and coasts formed mainly of carbonate rock, such as chalk or limestone, have beautiful blue salty waters and firm sandy or coraline sediment along shorelines. In a middle category, estuaries form where rivers meet the sea and tides mix fresh and salt waters, forming brackish water that changes seasonally as river levels rise and fall. Mangroves grow very differently in these various settings. In deltas, some of the largest mangrove trees in the world reach the heights of rain forests, with extensive roots penetrating into soft silty mud. In contrast, mangrove trees growing in the sediments of a carbonate shoreline are so much smaller that they look stunted, like ornamental trees in public parks. Why do mangrove trees grow so differently in different environments? In our view, the explanation lies in how climate, rivers, tides and waves form conditions for mangrove tree growth. The mud in deltas and estuaries with large tides contains high concentrations of essential nutrients. This creates benign environments where trees grow to their full potential. In contrast, coastlines where sediments are made of carbonate and tides are small tend to be nutrient-poor. This stunts tree growth and produces scrub forests along the shore. As mangrove trees grow, they store carbon from the atmosphere in their wood. More carbon builds up in mangrove soils with the accumulation of organic matter, such as dead leaves and branches. We wanted to know whether the ecological conditions that control mangrove growth in different settings could also indicate how much blue carbon these ecosystems accumulate over their lifetime, or how much carbon they sequester each year. On average, mangroves can store three to five times more carbon than upland tropical forests, mostly in soil. There is no question that mangrove wood and soils around the world have accumulated significant quantities of carbon since they started to grow. Mean values range from 50 metric tons of carbon per acre (125 metric tons per hectare) in delta settings to as much as 220 metric tons per acre (550 metric tons per hectare) in carbonate coastlines. For the purpose of curbing climate change, the most important question is how much carbon an ecosystem sequesters each year, mitigating carbon emissions produced from human activities such as burning fossil fuels. Carbon sequestration by mangrove forests is the amount of carbon that accumulates in wood or soils each year and remains stockpiled there, isolated from the atmosphere. In total, the world’s mangroves sequester approximately 24 million metric tons of carbon in soil per year. A mangrove forest on the Pacific island of Kosrae, in Micronesia, can store as much carbon annually as a tropical rain forest in Panama. Our review found very significant differences in the rate of carbon uptake by different types of mangrove forests. Mangrove soils in the intertidal zone gain elevation as sediments are deposited each year. Coastal zones with major rivers have some of the highest rates of soil formation, so they also have high annual carbon sequestration rates. Since mangrove trees grow taller in these more benign delta environments, they also sequester more carbon in their wood each year. 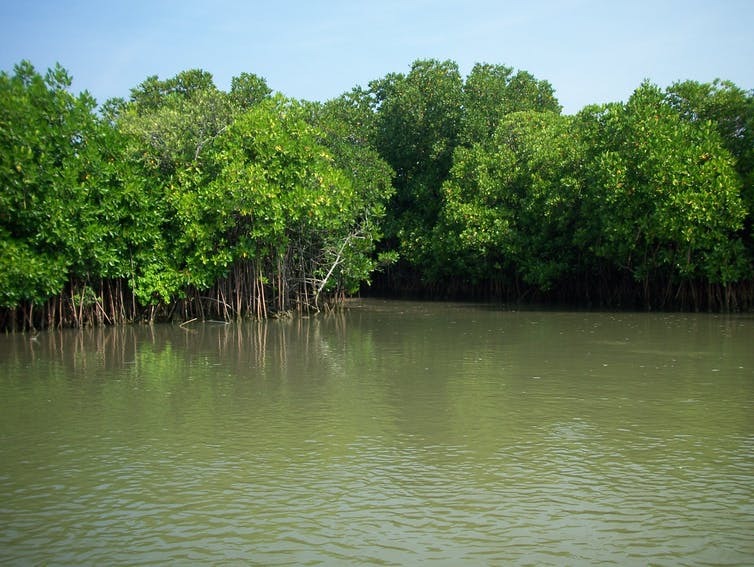 Overall, mangroves in deltaic coasts such as the Mississippi River delta, the Amazon in Brazil and the Sundarbans in India and Bangladesh can sequester more carbon yearly than any other aquatic or terrestrial ecosystem on the globe. These are the world’s blue carbon hot spots. In the town of Pajaritos in western Mexico, the government is paying fishermen to help restore mangroves destroyed by logging, tourism and bad fishing practices. However it is important to distinguish between carbon density in mangrove soils – the amount of carbon stored per unit area – and carbon sequestration, which is the amount of carbon that accumulates in that same area per year. Carbon sequestration is enhanced in deltaic environments because rivers continuously deposit sediment in mangrove soils. This leads to higher burial rates of carbon, both from the trees themselves and from carbon carried by the rivers. Delta soils also contain a lot of mineral sediment (rock), so they have a relatively low carbon content by volume. In contrast, in carbonate settings such as Caribbean islands, most of the soil volume is made up of plant roots, so it has a higher carbon content. But soil builds up in deltas more quickly, since rivers are always depositing new sediment. This distinction is important for conservation strategies. Destroying mangrove forests to build roads, shrimp ponds or other commercial projects can release significant quantities of carbon to the atmosphere – even in carbonate settings, since so much of the soil there consists of plant material. This makes it important to conserve mangroves in all types of settings. It also is very important to restore mangroves, particularly in deltaic regions, where they can increase those ecosystems’ capacity to clean the atmosphere of existing carbon dioxide. By improving our understanding of how mangroves function under different conditions, we can safeguard and increase these valuable blue carbon stores. Header image: Mangrove forest in Pichavaram, Tamil Nadu, India. Credit: VasuVR/Wikimedia, CC BY-SA.